Especially during the main seasons, Salzburg is a very touristy place. Beyond that, the city is rather small and you can easily walk in the city centre - where you will find most attractions - without much effort. 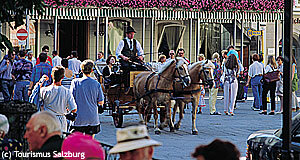 Nevertheless, many travel agents and sightseeing guides operate sightseeing tour businesses in Salzburg. A guided tour through the city has the advantage that you will get around very efficiently and certified tourist guides are true experts in Salzburg′s history, architecture and culture. Certified tour guides have to attend extensive courses and classes and are then accredited as official "Salzburg Guides". These certified guides are the only people who are allowed to give guided tours in the city of Salzburg. See the link to the certified Salzburg guides below. In addition, there are organised tours with non-certified tour guides, who do the talking inside busses or vans, where no regulations apply. Busses and vans also have the advantage that groups can easily get beyond the city centre. This is convenient if a tour includes the palace of Schloss Hellbrunn or even towns and villages in the Lake District. Bicycle tours are organised during the main season, as well as other "theme tours" - enquire details regarding "fashionable" tours with the tourist information centre in Salzburg. By far the most popular Salzburg tour (at least among visitors from overseas) is of course the "Sound Of Music Tour" - organised by various travel companies, including our partner Panoramatours. Note also other, usually smaller tour operators with similar offers. The "Sound of Music Tour" comprises of some Salzburg sightseeing, a pilgrimage to the main shooting locations of "The Sound Of Music" and is rounded up by a trip to the Salzkammergut Lake district. Busses for the Sound of Music tour depart from the Mirabellplatz square, just outside Schloss Mirabell. Note that you can also walk to most of the shooting locations of "The Sound of Music". Other "theme tours" in and around Salzburg include organised bus trips to the Kehlsteinhaus (Eagle′s Nest), the Salt Mines in Hallein, the Salzkammergut without the "Sound Of Music" fuzz, Mozart theme tours - and mountainous areas in the south of Salzburg as well as neighbouring Bavaria. Upon request, the certified tour guides of Salzburg are also willing to arrange your own "theme tour" according to your specific desires. We know for sure, because readers of Visit-Salzburg.net have once e-mail us and requested a Jewish-theme sightseeing tour for Salzburg - which a tour guide was happy to prepare and do. Rates vary hugely between companies and length of the tour. Cheaper Salzburg walking sightseeing tours will start at 15 to 30 Euros per person and typically last for two to three hours. Bus tours that involved the Salzkammergut (such as the "Sound of Music Tour") will be considerably more expensive, more like 40 to 50 Euros per person; these tours usually last about four hours and include the guide and bus transfer.